There is a disturbing lawsuit filed this month in Tennessee against CCA Silverdale and Hamilton County Sheriff Jim Hammond (left). Charity Flerl was incarcerated when she went into labor last summer. The police proceeded to force her to give birth while shackled because, as explained by one individual in this article, because “They’re criminals, so you never know what they might do.” Now here is the kicker: Flerl was not in for some violent offense. She was in for failure to pay child support. It is not clear what “they might do” in such a case: failure to pay child support on the new baby? Even if there was a lack of a single human being present, there is a ruling that would seem to offer some guidance. In Nashville last year, a federal court ordered a change in the city’s policy of shackling women during deliveries. The practice is barbaric and a clear example of excessive use of force and restraints. This is particularly the case for a nonviolent offender. We will be following this very important case closely. Give a man a badge and a gun and you have created a monster. issac look up bill windsor he is a one man warrior traveling the world making a documentary of any and all leo,judicial abuse,corruption…. the retaliation against him is unbelievable but has not stopped him…. Good ol rockytop, rockytop Tennesseeee! 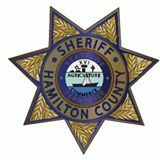 Welcome to Hamilton County Tennessee home of Sheriff Jim Hammond fraction of a human being.